We discussed 3D CAD surface 'play' as virtual sculpture. 3. reenact Kahn's Philadelphia via (enlarged) Campo Marzio. 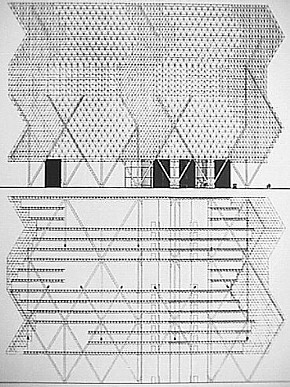 Kahn's City Hall + surfaces. A good look at very early Kahn, particularly his projects for Philadelphia, will shed interesting light on architecture of the 90s and the 00s. Metabolism as a physiological function operates via equal measures of destruction and creation, i.e., catabolism and anabolism. The metabolic is a visceral destructive/creative human process. Perhaps Venice should be reenacted like the caves with primitive painting in them. Make the original off limits and allow the tourists to visit the facsimile. Is progress really just another word for ongoing discontent? Cities have always been centers/engenderers of vitality. The word vitality relates directly to life, as does (the word) metabolism. Are cities always metabolic then? To many degrees, such as the day to day goings on, the answer is yes. But what of cities and their processes in the long term? Are cities metabolic over time as well? A safe answer is that many (if not most) large cities throughout the 20th century have manifest enormous creative/destructive dualities, i.e., metabolic natures. Berlin is a perfect 20th century example, and Baghdad is well on it way to being a perfect turn-of-the-millennium example. Even (North) Philadelphia has gone from one of the largest manufacturing (creative) centers of the world in the late 19th and early 20th century to now being a large urban area where huge factory complexes are long abandoned and 'decaying' and even 'disappearing' (ultimately destroyed) month to month. Given that capitalism has itself been described as "creative destruction" (or really destructive creativity as well), any city that is likewise a center of capitalism is by default metabolic--and here the mega-cities of so-called Communist China cannot really deny their capitalist natures because of their undeniable creative/destructive natures. All this also makes me wonder what the USA will be like when so-called 'urban sprawl' begins to age/show its ongoing metabolic nature over time. Perhaps therein lies a forthcoming perfect example of real estate development's undeniable metabolism. This book should be in audio format. That way you could listen while sleeping, and after about a week you could start talking like a Columbia grad without spending all that time and money. Now that would be radical! I'd say the real shell architectures were those caves some humans used to live in, and beyond that architecture became an applied shell, and going to an(other) extreme, a space station is all shell, but hardly natural. I see your point about architectures that fulfill nomadic intentions, but I also see mobile homes, trailer parks and even just automobiles as architectures that fulfill nomadic intentions better than hotels. Hotels fit more the oasis typology/metaphor, acting as both way-station and/or destination. Cabinets and Museums--virtually the same exact thing. Think about it. The last time I purposefully read anything on color (almost 10 years ago) was John Shearman, "The Functions of Michelangelo's Color" in The Sistine Chapel: A Glorious Restoration (New York: Harry N. Abrams, 1994). "Michelangelo's restless experimentation produces much inconsistency." Going back to Alex's initial statement, "In my continuing research into the history of architecture I am continually surprised by the lack of an adequate theory of change to explain the shift from style to style. At the same time I have become increasingly aware of the power of evolutionary theory to explain the concept and mechanisms of change," I am curious which shifts from style to style are being referring to. Are they the shifts from Greek to Roman to Early Christian to Romanesque to Gothic to Renaissance to Mannerist to Baroque to Rococo to Neo-Classicism to Eclecticism to Modernism to Post Modernism to today's architecture? Furthermore, what exactly substantiates the claim that an "adequate theory of change" is lacking from the explanation of shifts from style to style? ...you very much got, and explained far better than I could, what I was trying to get at regarding Alex's "Evolutionary theory and architecture" proposal. A. may indeed be right about there being a lack in architectural history when it comes to explaining shifts from style to style (and this interests me greatly), but I'm not convinced so far that evolutionary theory (which ever one that may be) is the best(?) way to explain shifts from style to style. Up until (more or less) the "International Style", architectures where very much linked to geography/locale and the politics(/religion) that comes with geography [--and here Norberg-Schulz's Meaning In Western Architecture offers good explanation]. Of course, European colonialism can be seen as an "internationalization" (or is it "globalization"?) of European/Western architecture precursing the "International Style," as well as the beginning of the eradication of many indigenous architectural styles throughout the world. Is this history best explained as evolutionary? Is the shift from Mayan architecture to Baroque architecture in Mexico, for example, something evolutionary? Not exactly survival of the fittest; more like survival of the one's with the guns and the greed, and, oh yes, the holy mission to spread the Christian faith. Personally, I sometimes wonder whether Mayan architecture may have sometime/somehow played an influencing/inspiring role in terms of (particularly) Spanish Renaissance and Baroque architecture. ... There's nothing fancy about the display, but I like the effect of "going through a museum" on a day by day, as opposed to room by room, basis. [Thinking just now:] a calendrically mnemonic museum design. What is perhaps most unique about contemporary aesthetics is that there are a whole lot of aesthetics to choose from. There is no predominate aesthetic on the planet today, especially not an aesthetic that predominates for any prolonged length of time and/or over any large portion of the planet. Then again... Maybe delusional characterizes the predominate, yet at the same time most denied, aesthetic of our time. On the occasion of the World Design Conference held in Tokyo in 1960, a group of young 30-something Japanese architects proposed "metabolism" as a new 'ism' for architecture and urban planning. Their idea was quite simple: architecture and the city should constitute an open living organism that grows through metabolism, instead of an enclosed, static machine. Arika Asada and Arata Isozaki, "From Molar Metabolism to Molecular Metabolism" in Anyhow (1998). What the Metabolists failed to realize is that metabolism (as a physiological operation) is a creative/destructive duality, hence, metabolism does not define a continuous organic growth, as much as growth integral with equal measures of destruction. Schumpeter called capitalism "creative destruction," which, if correct, essentially labels capitalism as being metabolic. There is no question that we live in very metabolic times. Unfortunately, most (product) designers today (seem to) remain oblivious to the fact that what is great design today will soon enough be tomorrow's trash. "...check out some of Peter Eisenman's work. It has an accidental quality--he sets up processes and systems and kicks back and waits to see what happens." As just described, Eisenman's methodology is then a process of intended serendipity rather than a process of pure accident. ..and then there's all the stuff that is now created and stored digitally, which sometimes gets put in digital museums. Are the large homes and all their contents of today something like subliminal evocations of museums? "A man's home is his castle." And just look at how many actual castles and palaces are now actual museums. "I want a McMuseum, hypersized." Take a moment or two to count the 'collections' presently in your home. The 'theory' that I utilize most now-a-days in terms of guiding/informing my design actions centers on the notion that the virtual realm is an 'other' place to work within as an architect and/or artist. The virtual realm (whose infrastructure is now largely the Internet and the general wired-ness of our planet) is a place additional/optional to the real realm. Although many current theories (and realities) see the real and the virtual merging in our daily lives, I more enjoy investigating the virtual realm in its more extreme position (which exists regardless of whether or not there is concurrent merging of the real and virtual going on). Although the quondam Liberty Bell Pavilion of Independence Historic National Park (Philadelphia) is officially for sale, the Park Service has nonetheless found a new (interim?) use for the building. It is now the security checkpoint for visitors to the Liberty Bell that is in the adjacent new Liberty Bell building. Today, while looking inside the former Liberty Bell Pavilion, I saw a man with outstretched arms being "checked" by a Park Ranger with a hand-held scanner right in front of where the Liberty Bell used to be with Independence Hall clearly in the background. Like they say, "Only in America." The point of this thread is... ...the ironic symbolism currently manifest by the architecture at Independence Historic National Park. Security checkpoints at IHNP are a post-911 phenomenon, and, as far as their 'design" there goes, they are makeshift and poorly executed. Using the former Liberty Bell Pavilion now also as a checkpoint adds symbolic absurdity to the mix. Granted this may all be temporary, but, if you are mindful of all the 200+ year history of this specific site, there's not much about it that hasn't just been temporary, or indeed ironic about the literal birthplace of the United States of America. Perhaps the reason it is so difficult these days to design a decent memorial is because architects for almost a century now are more trained at designing oblivion. which Acropolis do you prefer? The Acropolis as used by the ancient Greeks? The Acropolis as used by the ancient Romans? The Acropolis when the Parthenon was used as a Christian Church dedicated to Mary? The Acropolis when the Turks used the Parthenon as a munitions magazine (hence the 17th century explosion that pretty much wrecked the place)? The Acropolis as mass tourist destination with the Parthenon ruins slowly being further destroyed by air-pollution?